For many, myself included, watching a movie is looked at as a wonderful distraction from the troubles of reality, and thus documentary filmmaking can be a difficult pill to swallow depending on the subject matter. I find that I need to be in the right mood to sit down and watch real people deal with real issues and feel real pain, which is why you will never see me waffling between whether to watch Star Wars, Pacific Rim, Guardians of the Galaxy or a hard hitting documentary about assisted suicide. While you won't find many, or for that matter any documentaries listed near the top of my favorite films of all time list, I refuse to shy away from the experience and knowledge obtained from a non-fiction narrative. Each year a handful or more of truly special documentary films are released, and to not seek those out and see the world from a different perspective is a shame. Earlier this year I got the chance to see the film Life Itself, a documentary about the life and death of quite possibly the most beloved and recognizable film critic Roger Ebert, and it is a truly inspired work that paints a real, honest picture of his existence. It was a joy to experience the small glimpses into his life and his family, and the tears I shed over their loss in the end were the icing on an unforgettable cake. While Life Itself was without a doubt the strongest documentary I have seen thus far from 2014, I have now watched 11 total released this year and all of them have been solid, admirable films, the most recent of which is titled Virunga. A Netflix original documentary, Virunga focuses on a brave group of rangers whose goal is protect Virunga National Park, located in the Democratic Republic of Congo. The park has been subjected to war, animal poaching and a British company called Soco International exploring the possibilities of finding oil at the site, and the film is at its absolute best when it focuses on a man named André Bauma who cares for and looks after the gorillas that live inside the park. It is heart breaking to see these animals scared and sometimes killed, and watching men put their own lives on the line to protect the park and the creatures that inhabit it is inspiring and compelling stuff. Where Virunga misses the mark for me is when the film takes a detour away from the park and the chaos taking place inside it and instead uses undercover camera footage and interviews to detail the heartless motivation of the company Soco International, as we literally hear and see their plans to take the park and the lack of empathy they feel for the people and animals that care deeply for the land. On its own this material is technically very compelling and I understand the reason for it, as it directly ties into the fate of Virunga National Park, but this section of the film feels so different and out of place compared to our time in the park that I found it jarring, as if it killed the beautiful flow of the narrative established early on. Even with its flaws, Virunga is a very good film and absolutely worth a watch, but when I went into the experience I was hoping to feel the way I did after watching the Netflix original Oscar nominated documentary from 2013 The Square, a film that confidently maintained its singular focus throughout and knocked my socks off with the haunting feeling of actually being inside a war zone. 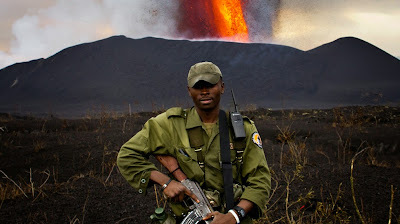 Plenty of the footage from Virunga did elicit a similar reaction from me, with a knot in my throat and my heart rate elevated as bullets literally fly past these brave rangers and camera operators, but I wanted more of these people and their passionate plight and less of an exposé about a shady oil company. I understand the choice to include the footage and information, but the pacing and fluidity of the film took a hit as a result.